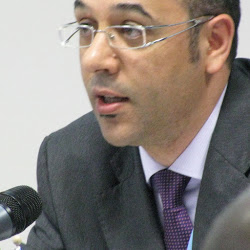 Mounir Ghribi is in-charge of International Cooperation and Strategic Partnerships and Director of the Blue Growth Initiative at OGS (National Institute of Oceanography and Applied Geophysics). He is a faculty member at Euclid Intergovernmental University, professor of Sustainable Development and Science Diplomacy. He holds a Ph.D. in methods for monitoring environmental change specialized in GIS and remote sensing from the University of Trieste; a Master in Open Innovation and Knowledge Transfer (MIT) from the Politecnico di Milano; a Master of Sciences (M.Sc.) in Environmental Management from the Mediterranean Agronomic Institute of Chania (MAICh), Greece and a degree in Environmental Engineering from the School of Engineering ESAM – University of Tunis II, Tunisia. Former United Nations Officer, in charge of technical assistance programmes on costal zone management, sustainable industrial development, cleaner production and renewable energy technologies at the United Nations Industrial Development Organization (UNIDO) Centre for Science and High Technology,. He has been nominated from the Italian Ministry for Education, University and Research (MIUR) to represent Italy in various international initiatives namely: the Euro-Mediterranean Dialogue Forum (Dialogue 5+5) and the G7 Future of Seas and Oceans.